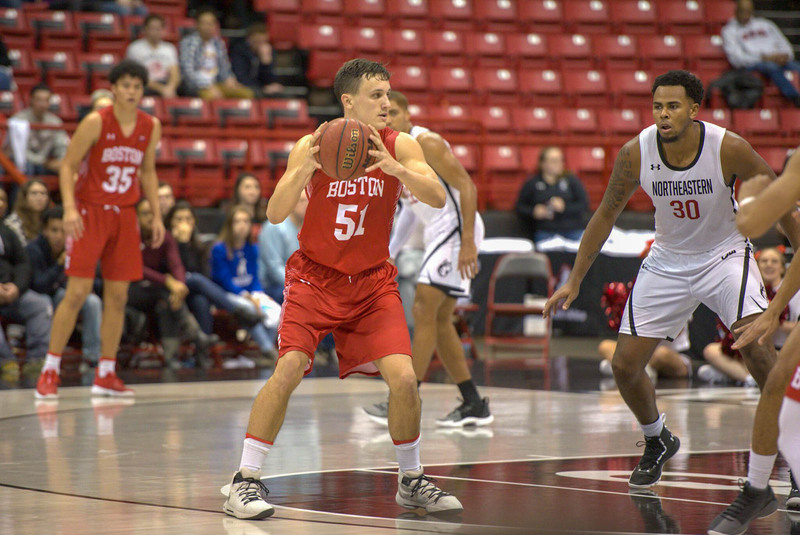 The Boston University men’s basketball team took the short ride to Matthews Arena, home of rival Northeastern University, Tuesday night for its first game of the season, where the Terriers (1-0) claimed a 77-74 victory. Coming in, Northeastern (0-1), which was selected to win its conference, had won seven of its last nine head-to-head matches against BU. However, within the first four minutes of play, the Terriers jumped out to a 12-8 lead behind junior forwards Max Mahoney and Tyler Scanlon, and after losing the lead in the second half, made a late-game rebound. BU head coach Joe Jones said he was most proud of the fight his team showed. Freshman guard Fletcher Tynen stood out in his first career collegiate game. Coming off the bench, Tynen played 11 minutes in the first half and played solid defense to go along with his two points and two rebounds. Behind standout redshirt senior guard Vasa Pusica, Northeastern withheld the BU run and battled back. Pusica scored 12 of the team’s first 14 points. Then, after switching to a full court press midway through the first half, the Huskies clamped down on defense. The Terriers were forced into multiple turnovers in the latter part of the half, and Northeastern took advantage. Senior center Anthony Green scored on several fastbreak dunks, energizing the crowd and swinging the momentum. At the end of the first half, Northeastern led 36-33. Pusica was the leading scorer with 16 points to go with three of the Huskies’ four assists while Mahoney led the Terriers with nine points. To start the second half, Northeastern seemed to maintain the ferocity that it ended the first half with. By the time the under-12 timeout arrived, the Huskies had extended their lead to 57-48. It was then that BU started to claw its way back. Scanlon started to take over, scoring a few buckets and taking over as the team’s main ball handler in the front court. He would finish with a balanced stat line of 16 points, eight rebounds and three assists. Redshirt freshman guard Alex Vilarino and sophomore guard Javante McCoy would combine for 16 points through the second half to help make the score 70-65 with about two minutes to play. Jones said he has high expectations for his new group of players, including Vilarino and Tynen. The Huskies missed two close shots in the paint that seemed to roll around the rim forever. On the next possession, freshman forward Jordan Guest made his only three of the game to cut the lead to 70-68. Mahoney was also fouled when going for the rebound. He made one of two free throws to make it a one-point game, the closest the Terriers had been since the start of the half. BU would take the lead on their next possession. Scanlon found a driving McCoy for the layup, causing the Terriers bench to erupt. After trailing for the entire second half, they had the lead 71-70 with 47.9 seconds left. Northeastern struggled to find points on the other end, leaning heavily on Pusica, who finished with 31 points. Pusica would make a layup to give the Huskies a brief lead, but Scanlon responded right away with a mid-range jumper that turned out to be the game-winning score. Pusica got two more chances for Northeastern, but a missed layup, a missed free throw and a missed three at the buzzer clinched a 77-74 win for the Terriers. Scanlon, who ended the night leading the Terriers with 16 points, also served as a vocal leader to spark the team in the second half. Answer the bell they did.